While most of the North Bound Interfaces (NBI) in a software defined networking (SDN) ecosystem are still at the network level, exposing plenty of details, NEMO provides an intent oriented programming language. 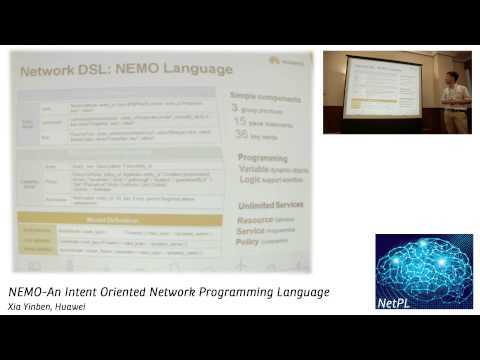 The NEMO language is based on a generic network operation pattern and application-centric network models. The intent based network model and interface provide a high level description of requirements to the network, providing a top-down abstraction. It hides the complexity of the network implementation, but enables applications to use the network. This talk will present the concept of the intent oriented NEMO language, along with the model, pattern, interface, and use-cases. Dr. Xia is a senior staff researcher within Huawei’s network research department from 2008. He dedicated his research effort in SDN and network programming language (NEMO Project). He owns 15 patents in related domain. He is leading a team to carry out SDN/NEMO research in Beijing. Before joining Huawei, Dr. Xia worked at IBM China Research Lab for 4 years after he got PH.D from Beijing University of Aeronautics and Astronautics.